The term ‘Vacancy Rate’ is heard quite a lot in property talk – but surprisingly few people actually know what it is or how to calculate it. The vacancy rate of a suburb or area is the percentage of properties that are vacant, out of the total number of rental properties. Current data shows that vacancy rates across the greater Brisbane area seem to average at about 3%*. This amount is regarded as a healthy market, or ‘equilibrium’. This means that there are enough vacant properties for tenants to move into, but not too many to create a glut of vacancies and bring the prices down. If we now consider the vacancy rate for an individual real estate agency, the goal is always to beat the average – that is, to strive for a vacancy rate under the industry average. This shows that the agency’s processes, marketing, communication, and efficiency is ahead of the competition. Above all, it means rental money in their Landlords’ pockets. 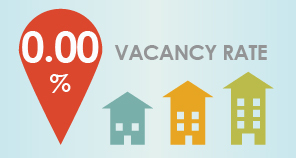 We are quite chuffed to reveal that our current vacancy rate is 0.003% – effectively ZERO percent! Do you know a property owner who is looking for an agency with solid results like this? Give us a call on (07) 3888 0098 or email admin@solutionsproperty.com.au.